In 1989 a group of juried artists decided to join together in order to promote the creation and appreciation of the handmade artwork of the region. Several years later, they named themselves the Blue Coast Artists. Based in Allegan County, the studios and galleries of the Blue Coast Artists dot the lakeshore area from Saugatuck to South Haven. On the first weekend of October, these artists will participate in the 22nd Annual Blue Coast Artists Tour which takes visitors from Fennville to South Haven along scenic Blue Star Highway and back roads awash in autumn color. Open to the general public, the tour is free. Watch how these artisans create the pottery, glassware, jewelry and paintings exhibited in their studios. Refreshments are also provided. This year the event is scheduled for the weekend of October 1-2 from 10am-6pm. Official brochures and driving maps are available online and at various area galleries. Call Dawn at 269-236-9260 for more details. 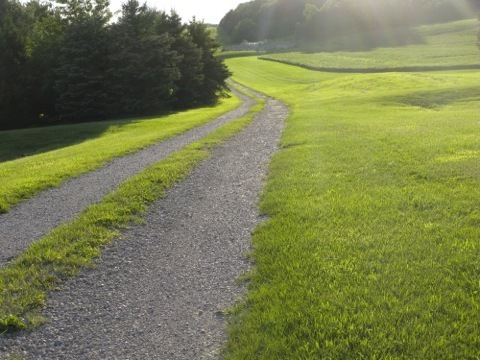 The map will also include directions to the ten member agri-tourism farms of Lakeshore Harvest Country. Drive along the picturesque vineyards and farms of Fennville untll you come to a turn of the century schoolhouse on a quiet country road. This quaint 1890s building is home to the Blue Roan Studio. Inspired by such people as C.S. 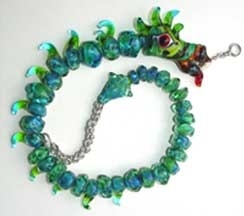 Lewis, Jim Henson and Dr. Suess, artist Jessica Bohus creates unique glass and metal jewelry and animals. Whimsical wire animals, metal bugs in jars, glass beaded ponies and silver jewelry are only some of the art pieces that spring from the creative mind - and the torch - of Jessica Bohus. And for those who may find themselves suddenly inspired when they tour the studio, Jessica has glass beads available to create your own one of a kind jewelry piece. Open May - October 8th, Friday-Saturday 11-5. Anyone along the lakeshore who loves handmade stoneware knows that three miles north of South Haven is the studio of Mark WIlliams. Known for his leaf printed platters and bowls, Mark's techniques also include wheel thrown pottery and textured slab work. Williams' pottery includes vases, dinnerware, oven safe casseroles, mugs, soup tureens, and one of a kind pieces. Commissioned pieces are welcome. Before leaving the wooded setting where Blue Star Pottery is located, remember it's just a few steps to the studio of fellow Blue Coast artist Suzi Lattner. Open May - November, Friday-Sunday 11-5. Open year round by appointment. West Michigan art lovers are well acquainted with the unique and beautiful work of internationally known artist Anke Richert-Korioth. A restored old farmhouse located between Pier Cove and the small town of Glenn serves as her summer studio, making it convenient for visitors to the lakeshore. Richert-Korioth's mixed media paintings include such elements as plaster, paper, modeling paste, foil, photography and acrylic paint. 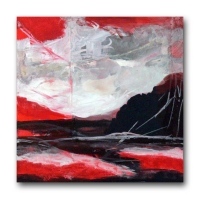 Her artistic vision is best stated by award winning Anke herself: "I try to move beyond borders into the world of color, space, light and texture. My goal is to elicit emotion." Khnemu is not only an artists' studio, it is also a working farm. A large restored red barn houses the pottery studio and fine crafts gallery, while outside visitors are greeted by chickens, turkeys, ducks, peacocks, and other animals that live on this extensive farm dating from the 1890s. 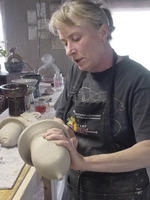 Dawn Soltysiak is the artist in residence and her beautiful pottery has become prized by collectors. 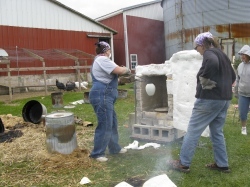 For those who love raku, don't be surprised if artisans are behind the barn, pulling raku pieces from the outdoor kiln. 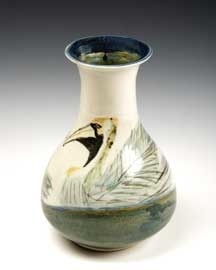 The raku can be purchased in the gallery along with pieces from other regional artists. Open April 1 - November 27, Wednesday-Sunday 10-5, Open Memorial Day, July 4th and Labor Day 10-5. Visitors are welcome the rest of the year by appointment. 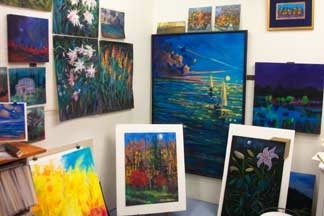 Classes and workshops are offered year round in the studio by Dawn and visiting artists. 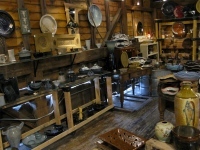 Housed in an antique turkey barn, Lake Effect Pottery is a gallery and working studio owned by Lee McKee. Lee has been a member of the Blue Coast Artists Tour since 2002. Along with Lee's affordable, hand thrown porcelain pottery and stoneware, the gallery features the work of other local artists. Visitors can also watch how McKee makes these beautiful functional pieces. Pottery workshops and classes are offered April thru November. When you're done shopping for such items as teapots, berry bowls, French butter dishes and oil lamps in the studio/gallery, take a few moments to watch the horses in the paddock outside. Btw, look out for the chickens. Open April - November, Thursday - Saturday 11-5, Sunday Noon-5. Open Memorial Day, Labor Day and 4th of July. 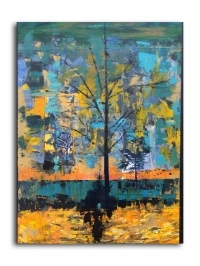 On a winding, tree-lined road right off Blue Star Highway, art lovers will discover the mixed media paintings of Suzi Lattner Zwissler. A cottage set among the woods serves as Lattner's studio and gallery. Don't be surprised to find her working on one of her bold and colorful paintings when you arrive. Open most weekends. Call for hours or an appointment.